Royal Enfield tweeted the teaser trailer for the upcoming Himalayan Camo Edition recently. The tweet further quoted ” Takes after the mountains. Built to be one with it. Coming on January 12.” This clearly indicates the company’s plan to launch the upcoming Himalayan special edition in the coming week. The tweet also featured a sweet two-dimensional animation with the Himalayan running over mountains. The interesting part is that the bike featured in the video carries white colour while the mountains are painted in camo shade that the upcoming special edition bike is supposed to be wearing. The upcoming 2018 Royal Enfield Himalayan Camo Edition is launching on 12th January 2018. With several examples reaching dealerships, the deliveries will start instantly post-launch. The outgoing Himalayan FI retails for INR 1.65 lakh ex-showroom Delhi. The upcoming Himalayan being a special edition will cost a little premium over the existing model. We expect the upcoming Himalayan special edition to be priced around INR 1.75 lakh ex-showroom. 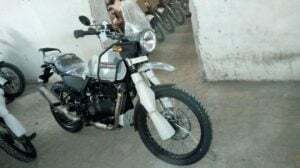 The spy shots of the upcoming 2018 Royal Enfield Himalayan Camo Edition were spotted on the web towards the end of 2017. Images from several angles were spotted online suggesting an early launch. With the bike reaching dealership indicated a launch soon which was confirmed by the company’s official tweet. The images indicate the upcoming special edition bike is parked at one of the company’s service centres preferably getting a pre-delivery check post shipping. 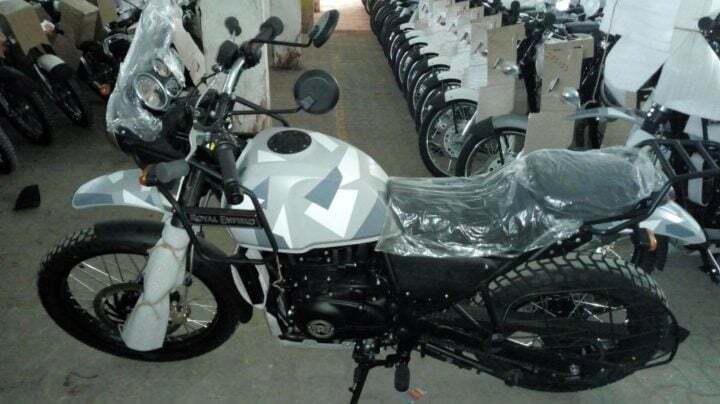 The upcoming 2018 Royal Enfield Himalayan Camo Edition will be based on the outgoing Himalayan FI model. The camo paint/sticker job will be the only distinguishing factor for the upcoming special edition. The fuel tank, front fender and the rear fender will adorn the grey/white camo colours. The mechanical underpinnings are exactly the same as the outgoing model. Powering the bike is a single-cylinder 411cc SOHC engine with fuel-injection and BS-IV compliance. The engine churns out 24.5 bhp of power at 6,500 rpm and 32 Nm of torque at 4,250 rpm. The engine is mated to a 5-speed gearbox with a chain-type final delivery powering the rear wheel. Holding the engine in place is a half-duplex split cradle frame. The cycle parts include a 41mm telescopic suspension at the front and a rear monoshock with linkage. Stopping power comes from disc brakes at each end with a 300mm disc at front and 240mm at the rear. Stay tuned for more info on the new 2018 Royal Enfield Himalayan Camo Edition and latest news on upcoming bikes in India.